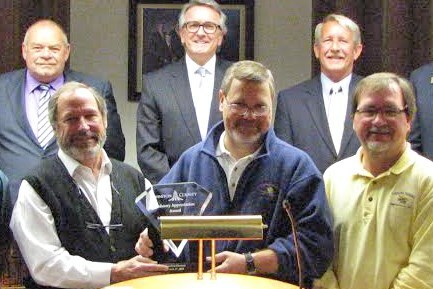 On Monday, March 3, the Johnston County Commissioners and the Johnston County Economic Development Advisory Board recognized Carolina Packers of Smithfield for their long standing commitment to Johnston County by honoring the company with the County’s first “Industry Appreciation” award. This award will be presented quarterly to Johnston County Industries. Carolina Packing Company, as it was originally called, was founded in Smithfield, North Carolina by John A. Jones, Sr., a native of Claxton, Georgia, and a group of local businessmen on December 12, 1940. Later, in 1941, the name was changed to Carolina Packers Incorporated. From the very beginning Carolina Packers created a much needed livestock market for Smithfield area farmers, many of who became charter stockholders in the new company. For the next 50 years Carolina Packers processed locally-grown beef and pork into hams, bacon, country link sausage and their famous family of “Bright Leaf” hot dogs, bologna, red-hots and smoked sausage. In 1997 Carolina Packers discontinued slaughtering operations to concentrate their efforts on the Bright Leaf product line. The “Bright Leaf” name is rooted in Johnston County’s agricultural heritage that was dominated by tobacco during the early years. On US Highway 301 in Smithfield, NC where their plant is located, it is now called Brightleaf Boulevard because of the number of tobacco warehouses that lined the highway through Smithfield during the mid to late 1900’s. In addition, many of Carolina Packer customers and suppliers grew tobacco as part of their farming operations, so they adopted this name, along with the tobacco leaf in their logo, to identify with a proud agricultural heritage. Award to Kent Denning and Jimmy Butler of Carolina Packers. In March, 1977, Mr. Jones’ son, Buck, became president and remained so until his death in 2005. Buck’s wife, Jean, continues to carry on the food service legacy founded over seventy years ago. While Carolina Packers has undergone many changes over the years, they have remained loyal to the traditions that have made them a family favorite on the dinner tables of eastern North Carolinians for over seven decades. Like their famous Hot Dog recipe, their commitment to providing good tasting, wholesome products, has not and will not change. 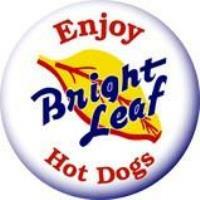 Further information about Carolina Packers, visit www.carolinapackers.com or follow them via facebook at Bright Leaf Hotdogs.